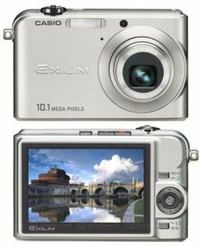 ePhotozine reviews the Casio Exilim EX-S600 and writes - "The diminutive proportions of the Casio Exilim EX-S600 make this very appealling as a camera to just slip into your pocket, and logic dictates that photographers looking for this kind of camera wouldn't appreciate the inclusion of advanced photographic features. 'Best Shot' scene modes, are provided to offer some control over exposure and white balance, but that's about it. The LCD screen isn't the clearest around, but it does the job and the same can be said about the image quality, not startling, but acceptable." 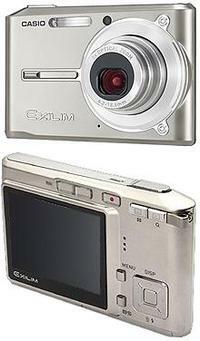 The Casio EX-S600 is a super-slim six megapixel camera that is roughly the the shape of playing card. The Casio Card Camera also has anti-shake technology, 3x optical zoom, long battery life (300 snapshots or up to 110 minutes of continuous movie recording), and a 2.2 inch LCD for photo viewing. Did I mention that the EX-S600 has a Movie Stabilizer feature helps to make movie recording easier than ever before! Wow! Coming in silver, orange, or blue, the Casio Card Camera retails for $400.